Equimins Blooming Pet Inner Balance Probiotics is a daily supplement rich in beneficial bacteria to help maintain a healthy and active gut. Containing the important strains lactobacillus acidophilus and Bifidobacterium, together with prebiotics to feed the friendly flora, Equimins Inner Balance Probiotics is highly recommended as a quick pick-me-up and for use at times of stress. 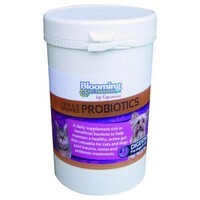 Equimins Inner Balance Probiotics is also perfect for cats and dogs post trauma and during antibiotic treatments.